In late May I drove down to Hollywood Beach, Fl and detected several beaches for a week in Dade and Broward counties. The water conditions were poor due to the wind and heavy surf plus the beaches were sanded in because of the unfavorable winter-winds which normally move the sand overburden away from shoreline and exposes the hard bottom where most of the gold is found. Fortunately I was still able to water-detect one of my favorite spots and found three 14kt bands, two of them on the last day. 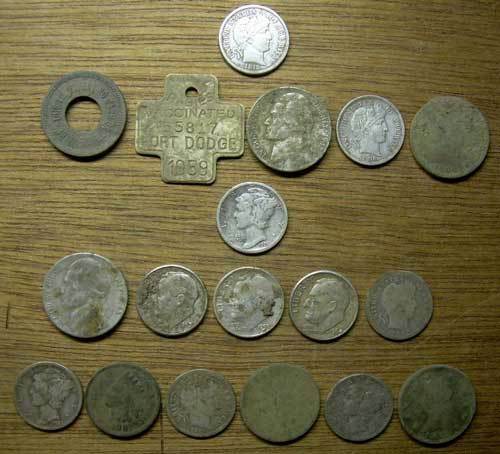 I also took the Explorer II along to see if I could find more silver at a park that had produced about 20 silver coins several years ago using a Whites MXT and Fisher CZ70. 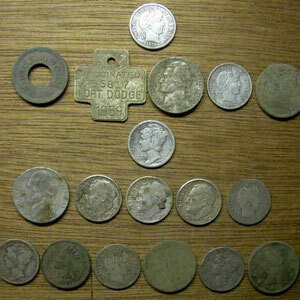 The ground was extremely dry due to drought but I was able to find eight more silver dimes. On my drive up the coast to visit a friend, I stopped at another spot that had produced several nice rings in the past. About 45 minutes after getting in the water I found a 14kt wedding ring with 14 diamonds. Total weight of the four rings was 12.6 dwt or 19.5 grams. The large earring is gold plated and the old gray corroded ring is silver. The heaviest ring is the white gold one with the rope pattern at 4.9 dwt or 7.6 grams. The coin in the middle of the dimes is a cheap lead copy of a gold '8' escudo Spanish coin I found wet sanding in Ft Lauderdale. The bracelet surrounding the dimes is costume jewelry. A little more than week after arriving home from Florida we received an unsettling call from our daughter who is attending Ohio U. She had fractured her knee a week before final exams were to start, so we hooked up the camper, and threw the detecting equipment and dogs in the van before heading north, hopefully to help her through her final exams. Last fall after helping her set up her dorm room, I found a spot to detect with potential for some old coins. 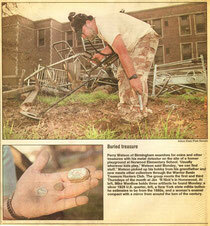 I was told that detecting was permitted and the area had been in use since the 1850s. 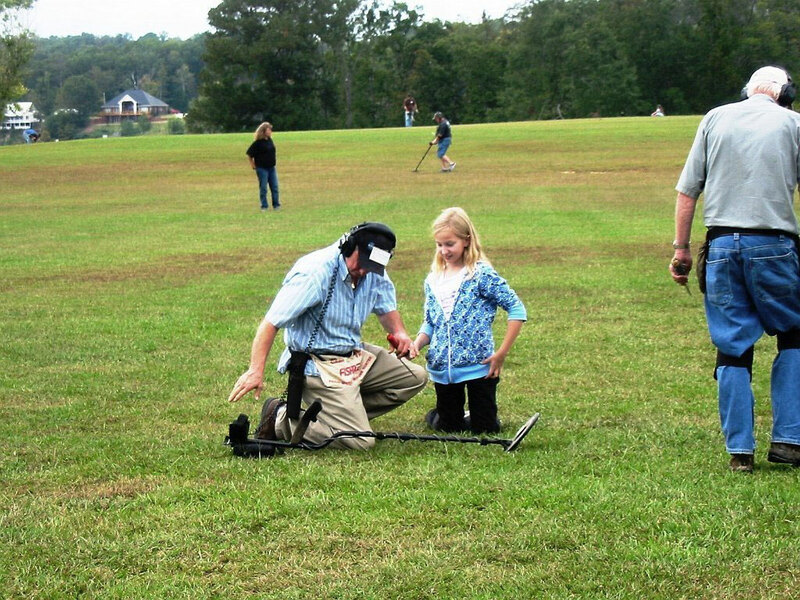 Originally we had planned to arrive a day or two early so I could do some detecting before bringing our daughter home at the end of the quarter, but her injury ended up giving me several more days to detect. 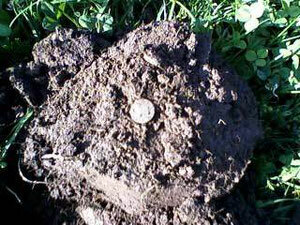 The few extra days really helped because most of the coins were found on the last two days. 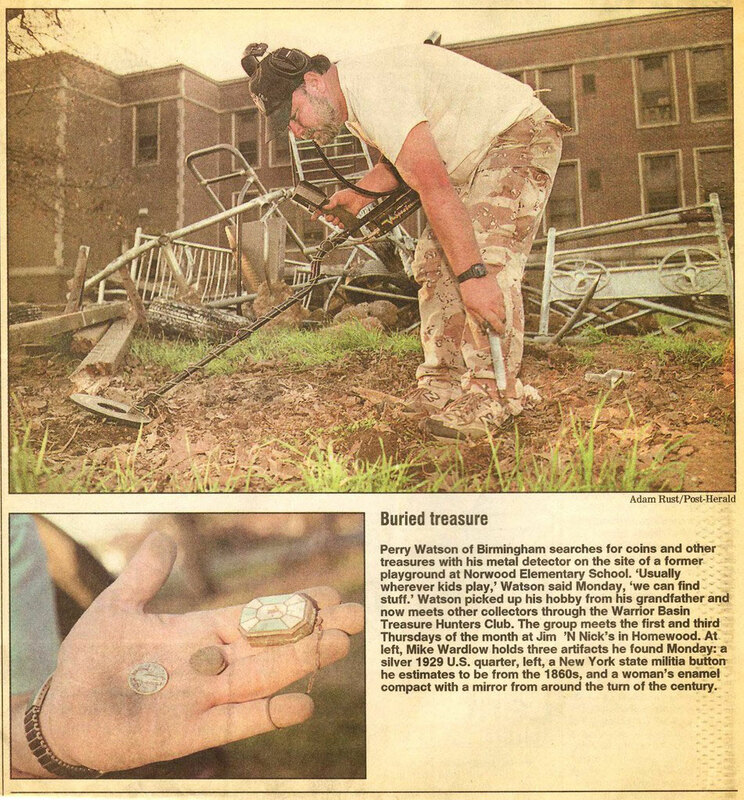 Most of the area was loaded with non-ferrous trash and rusty nails, as evidenced by the 43's war nickel and 53’ Rosie which have obverse nail stains. Both were iffy and unusual signals which I’ll usually dig in an older area if more than 3-4” deep. I also found a wheat and 3” bent nail in the same plug and at the same level with the nicer 1906 barber dime. I had a couple of firsts. I found my first shield nickel, unfortunately it's quite worn with no date. I also found my first Denver minted barber coin. 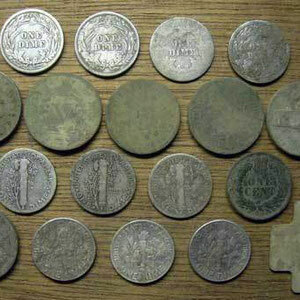 The first picture of the un-cleaned coins in five separate rows shows the order the coins were found. Each line is a different day. The more worn 1906 barber dime has an ‘O’ mint mark. 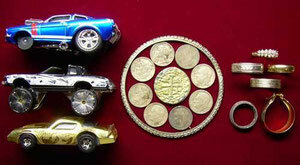 The token is a basic ‘no value amusement token’. 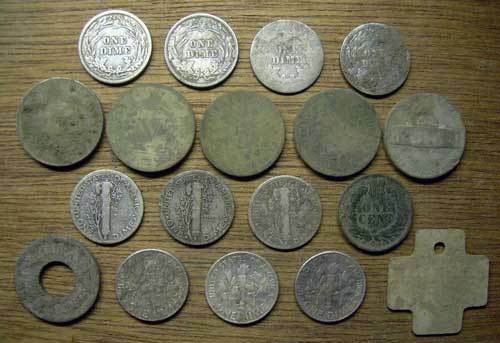 A local hunter named Gary who uses a DFX, told me that he had found an 1857 seated dime a few months earlier in the general area. I hope to find a few more coins when we go back in the fall if the other Gary doesn’t buy an Explorer and find them all this summer.